Palo Verde, is a small deciduous tree native to washes and sandy areas in desert woodland below 1,200' of California's Colorado Desert. 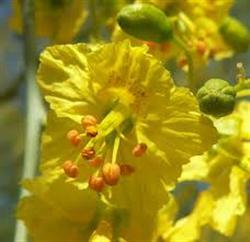 Masses of fragrant yellow flowers appear in March-May in nice contrast to the yellow-green bark. Fast growing when young, it can reach to 15'-20'. Prune to form a canopy that you can walk under, else you have a short trunk and a dense thicket of branches. Although deciduous most of the year, it is providing nesting habitat for the birds, and light, lacy shade for under story planting.